Skin-prick allergy tests for foods are extremely useful. They are also safe, painless and simple to do. This is a precise way to identify the offending foods. Eczema cannot be properly managed without discovering the foods and inhalants that are the culprits setting off the eczema cycle. Skin-prick testing identifies possible allergens. When done properly, it is a gentle test. Skin-prick testing is simple and should be pain free. A small droplet of oil, which contains the specific allergen (a food or an environmental-allergen) is placed on the skin. This is usually done on the back, for babies and toddlers, and on the forearm for older children and adults. Next, the skin surface is very gently pricked through this droplet. A positive test starts to occur within 5–10 minutes: a small wheal (like a little mosquito bite) develops. The size of the reaction (the wheal size) is measured at 10–15 minutes. It can get a little itchy but settles down in about half an hour. In children, skin prick testing is accurate. With age, the skin-prick tests tell you more about past food allergies rather than present clinical intolerances. Therefore in adults, skin tests for foods are less useful. The skin-prick test measures immediate reactions. It is a test that measures the “IgE-sensitivity” to the allergens which have been pricked gently into the skin. As soon as the allergen gets into the skin, it comes in contact with the allergy cells in your skin (the mast cells, which are packed full of histamine). If your mast cells have been sensitized to that allergen, they will immediately release their histamine, and this creates the wheal, just like a mosquito bite. The skin-prick test is a biological reaction and takes about 10–15 minutes to get to its maximum intensity. If the child has been treated with an antihistamine within the preceding 24 hours, then the skin tests will be attenuated. In other words reactions will be less dramatic and will take longer to show up. We recommend that all babies, all children and all adults with eczema or asthma should be tested with a selection of skin-test allergens. All breastfed babies with eczema need skin-prick testing. All people who have troublesome allergy symptoms should be investigated by skin-prick tests. Consequently, in my clinic, I do skin-prick testing for all children with eczema. Skin-prick tests can be done at any age: even on new-born babies (although it is less reliable at this age). It is my routine practice to do the first set of skin-prick tests at about three months of age. By this age the baby has developed the capacity to mount a specific IgE-response in the skin. But, if the baby has bad eczema in the first few weeks of life, then it is useful to do the skin tests earlier. This is especially helpful in breastfed babies with eczema. Most of the time these babies are reacting to food proteins that are coming through in their mother’s breast milk. By accurately identifying what the baby’s skin is reacting to in the breast milk, we can then advise the mother about what foods that she should be avoiding in her diet. Usually, the eczema will completely go away. What allergens can be tested? There are two categories of allergens that you can be tested for: food and inhalants. In adults, testing for shellfish is important. Usually, food reactions to fruits and vegetables cannot be successfully tested by skin tests – that is because these fruit and vegetables reactions are usually caused by the chemicals in these foods, rather than by the food proteins. animal dander (cat fur, dog hair, horse hair, and feathers). Most allergists do their own skin-prick testing. We carry out skin-tests on my patients as a routine part of their normal consultation. This gives me the opportunity to interpret their results as soon as they come up, and in context with their clinical story. They are so useful because they can give immediate answers to the eczema triggers. Also, many medical laboratories are set up to perform skin-prick tests. You can ask your doctor to refer you to one of these laboratories for these tests. Yes, you should ask for skin-prick tests to help identify any suspected allergens if you have eczema, asthma, hay-fever and suspected food allergy. Many doctors do not understand the value of these skin-prick tests so they need to be encouraged to request these tests. If you are not able to get these skin tests done, then another option is to get the IgE blood tests: these are called EAST (enzyme allergosorbent test) or RAST (radio allergosorbent test) tests. These tests give you the same information as the skin-tests. They test for levels of “specific IgE antibodies” in the blood to each of the allergens of interest. When should skin tests be repeated? It is good news that most food allergies go away as you get older. Coinciding with this, the skin-prick tests also wane with age. That means carrying out regular skin-prick testing is useful in tracking the current status of the food allergy. Also, repeating the skin-prick tests help to confirm to the parents that they are indeed making a difference by strictly controlling their child’s diet. It is our practice to conduct skin-prick tests at the ages of 3–6 months, 12 months, 2 years, 3 years, 5 years, 8 years and 12 years. 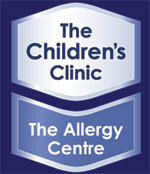 We find that giving families accurate feed-back about the progress of their allergies is extremely helpful. 1. Get skin prick tests if you can – especially to egg, milk and peanut. 3. Whilst breastfeeding you will probably need to go off dairy, egg and peanut. 4. Yes, use a 1% hydrocortisone cream for another month. 5. Avoid all egg, dairy and peanut in his solids. This baby is typical. His eczema would have gotten progressively worse if mum had not changed her diet. The skin test helped mother work out what foods she needed to avoid. Because the skin tests gave her certainty about her diet, it was easier for her to comply. But skin tests are not the whole answer. This is because many foods, especially dairy and gluten can cause the delayed onset type of reaction. Under these circumstances, the skin tests are negative for dairy and gluten. If the skin-prick tests are negative, then dairy or gluten should still be suspected. To make a diagnosis of gluten-sensitivity, blood tests are needed. Should the eczema not settle – again blood tests are needed to check out immune function. Food reactions are not the only cause of eczema. My 11 week old son is exclusively breastfed and has eczema over much of his body along with bowel motions with a lot of mucous and occasionally bloody mucous. I have cut out all dairy, wheat and eggs. This has definatly helped but he still suffers with tummy pains, crying and his eczema continues. We live in Blenheim. He is my third child. My second child is very special needs and it is hard to get away, ie travel to Chch. Do you hold clinics in the top of the South Island at all? My grandson is 10 months old right now and we worry that he has a peanut allergy like his mother. Thank you for letting us know that allergy testing can be done as soon as the 3-month mark if you’re concerned about potential food allergies. We would like to know if he has an allergy before we are comfortable with sending him to daycare.